Unfortunately this project is currently unavailable. Volunteer at International Animal Rescue's orangutan project, working towards the rehabilitation of these great apes. Located in the small town of Ketapang, West Kalimantan, International Animal Rescue’s orangutan sanctuary exists to rescue, rehabilitate, and release as many of Indonesia’s great apes as possible: since the centre opened its doors in 2010, an incredible 170 orangutans have been rescued, with a further 40 being released. It is these tireless efforts which have put the centre on the map, earning IAR their position as a conservation authority. Due to the development of palm oil plantations in the area destroying much of Borneo’s rainforest, countless animals have been left vulnerable and without homes. This, in turn, puts the species as a whole at serious risk, and the project needs your help to continue the exemplary work that they have achieved thus far. By becoming an orangutan volunteer, you will have the opportunity to become a part of IAR's story, providing support across an array of important activities such as enrichment, maintenance, and construction. Your hard work could truly make a difference to the conservation of Borneo's orangutans, providing IAR with the ability to continue taking in, rehabilitating, and releasing great apes for as long as their efforts are needed. You can learn more about the cause by watching this interview with Alan Knight. This programme is designed to support International Animal Rescue by providing help at their orangutan rehabilitation centre in West Kalimantan, Indonesia, by way of the activities listed below. Please note that these activities are not guaranteed, and that your time at the centre may vary from what is described below. You will work at IAR’s wildlife conservation and rescue centre in Ketapang on an array of tasks, which will vary depending on what is most necessary at the time. Activities may vary from helping to erect fences, to building walkways for members of staff and other volunteers to use. You may also work on the construction of feeding platforms for the centre's younger orangutans, among other tasks put in place to aid the animals at the centre. Borneo's humid climate means that certain structures (such as enclosures, boardwalks and towers) require constant upkeep - add to that the boisterous nature of some of the orangutans, it comes as no surprise that maintenance is such a vital and common task at the centre! Your involvement here could entail anything from repainting buildings to repairing enclosures damaged by the apes, to name but a couple of possibilities - no matter what this task entails, it is certainly necessary, so be prepared to be flexible and to put in hard work. Enrichment is key to keeping the orangutans at the centre stimulated, and you will be involved in the process of making enrichment for the apes. These activities help to promote natural behaviours in the orangutans, drastically enhancing their potential for release. This activity may include setting up hammocks, ropes, and swing tires for the orangutans to play with, as well as using natural materials (such as leaves and bamboo) to create fun puzzles stuffed with fruits and nuts. This is one of the most important and enjoyable activities at the centre and will help to keep the animals active and entertained! To help keep the food bills down, the centre is growing its own local produce to help feed the orangutans. You will take part in organic farming activities during your time here, including planting fruit trees and harvesting vegetables. Due to the wildfires of 2015, tens of thousands of hectares of forest were affected. International Animal Rescue has been working on various reforestation initiatives to replant lost segments of forest and restore important orangutan habitat, carrying out work alongside local communities who have an important relationship with the forest. IAR plans to plant thousands of trees and this work is a fabulous way for volunteers to get involved. There are few more tangible contributions that you can make to secure the long-term survival of the orangutan than planting a tree. On your day off each week, you will have the opportunity to explore other areas of Ketapang such as Hutan Kota, a natural park where you may spot proboscis monkeys! There are also local beaches where you can watch the sunset whilst enjoying a relaxing drink from a coconut. The town of Ketapang has markets, numerous shops, and a Buddhist temple– why not explore some of the local culture? Please note itineraries are subject to change and what follows is only a rough guideline. You will arrive in to Ketapang Airport in West Kalimantan, where you will be met by a project representative and transferred to the volunteer house which will be your home for the duration of the project. Get to know your fellow volunteers over a welcome dinner, undertake an orientation with the project staff, and settle in for the night – you have a busy day ahead! During this time, you will be working six days a week between the hours of 9am and 4pm (with Saturdays as a ‘half day.’) You will undertake an array of activities as listed in the previous section of this page, however much of your work will involve construction and maintenance. Your tasks will be determined by necessity, with itineraries varying from month to month due to the unpredictable nature of the project. Sundays will be spent at leisure. This will be your final full day at the project site, and after saying goodbye to the orangutans you will enjoy a farewell dinner with your group. Make sure to get plenty of rest in preparation for your journey home! Today is your last day, and you will take a private transfer to Ketapang Airport for your return flight home, or to commence your onward independent travel plans. During the 11 years that the IAR Ketapang centre been running, there have been a number of successes alongside a series of difficulties which have impacted the project. While the project has managed to expand dramatically in size (a 20% increase of land was obtained in 2017 alone), the necessity for more islands and better facilities has become urgent due to the masses of orangutans left homeless as a result of 2015’s wildfires. Despite these difficulties, however, the sanctuary have managed to rescue 170 orangutans since opening their doors, releasing a further 40 orangutans as part of their release programme. It is this programme which the project is keen to focus on, as they are systematically reintroducing the animals to the wild. Of course, the project’s mission does not end there. They are actively encouraging volunteers to get involved with reforestation activities in the area, working in tandem with the local communities to benefit the areas around their homes. Finally, the project is in the process of building an education centre which will eventually be used to host lectures and house students, enabling visitors to the centre to learn more about the importance of conservation and how they can make a difference. Activities such as this one simply would not be attainable without the help of volunteers: without time spent working at the project site on the construction and maintenance of enclosures, climbing structures and more, IAR would find it much more difficult to focus their attention on helping the orangutans, either in the immediate future (via rescue, rehabilitation and release) and the distant future by way of educating locals, and teaching them how to live in harmony with the rainforest and its inhabitants. 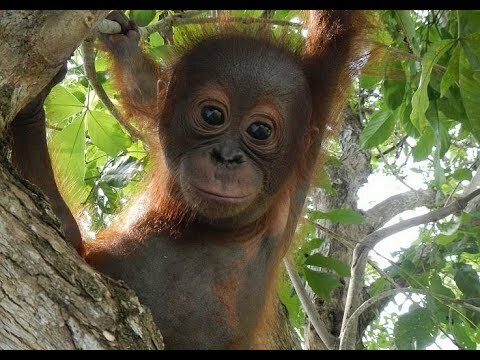 Ever thought about becoming an Orangutan Sanctuary volunteer? The IAR Orangutan Project Achieved So Much For Wildlife Conservation In January - Check Out Just How They Did It! The IAR Orangutan Project had an extremely busy, but extremely successful January! They released multiple animals, treated those out in the field and more! Check out just what they've been up to during their endeavours to aid wildlife conservation in Borneo, and to see how you can help this orangutan conservation project! From orangutan rescue to environmental disasters, 2017 has been fraught with heartwrenching stories about nature. Read on to learn about some of the stories from our own projects, as well as those from elsewhere around the globe. Throughout the duration of the project, you will be accommodated in a rented property located around 30 minutes’ drive from the orangutan centre. The house will be shared with your fellow volunteers, meaning that the kitchen and bathrooms are also shared. Bathrooms are comprised of the traditional drop-toilets, and you will have basic washing amenities in the form of a container of cold water and a scoop to pour the water over yourself. While these facilities are basic, they are practical, and the cold water of the washing facilities will come as a bit of a relief in the humid atmosphere! Each volunteer will have their own bedroom equipped with linens and pillows, but we do recommend that you bring your own towel for use when freshening up. There is WiFi in the house, but power cuts do happen so be sure to bring a range of entertainment with you! You will be provided with two meals per day, Monday to Saturday. Please note that breakfast will be at your own cost, but there are shops in the nearby towns for you to pick up essentials such as cereals and bread. 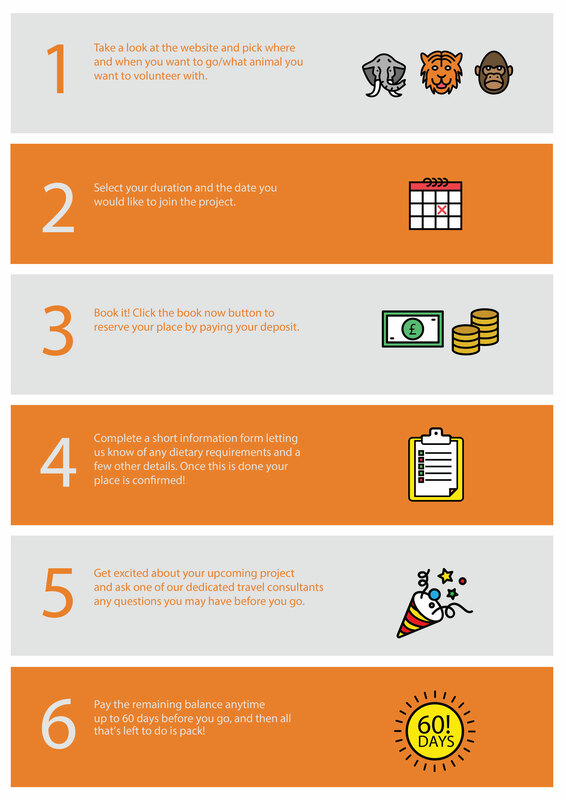 Lunch and dinner are pre-prepared for you by the project staff and can be tailored to your needs – please download your free project guide to learn more about this! On Sundays, no food will be prepared for you by the project staff, so we recommend paying a visit to one of the great restaurants in town and getting a taste of the local culture! Most of your work here will involve physical labour, so we ask that all volunteers have a relatively high level of fitness. You will be on your feet a lot during your time here, and temperatures are very hot and humid, so please make sure that you stay well-hydrated and are aware of the amount of effort expected from you! A positive mental attitude is key, as is your ability to work well as part of a team. The vaccinations you require will depend on your medical history. We recommend that you consult your GP regarding your own immunisation needs. In conjunction with this, we would also recommend that you check Fit for Travel’s website. The Great Projects are not qualified to provide you with medical advice. Orangutans are highly susceptible to human diseases and something as minor as the common cold can prove fatal to these Great Apes. In addition to this, an environment of constant change, with new volunteers going to the project every four weeks and being in contact with the orangutans would be very detrimental to the orangutans' well-being. With no consistency in their lives, behavioural problems arise. They also have a tendency to begin to trust humans which could be damaging should they be released back into the wild, as they will become easy targets for poachers. Finally, an orangutan is around 7 times stronger than an adult male human, so a 'no contact' policy is just as crucial for your well-being as orangutan welfare. That is not to say that you will have no interaction with the orangutans; it simply means that you will have no direct contact with them. You will still observe them on a daily basis and see how your contribution to their husbandry and enrichment makes a real difference in these great apes' lives. For more information please view our article on hands-on contact with orangutans here. What is the best time to volunteer? Since this project is based at a rehabilitation sanctuary, you can expect to see orangutans year-round. Weather may play a role in booking your preferred date, but please note that temperatures are relatively consistent and that it can rain all year round. The distinct ‘rainy season’ falls between November and January, but it is important to remember that the orangutans need year-round care, no matter what the weather. You will need to arrive into Ketapang Airport on the start date of your project between 7am and 5pm. Here, a project representative will meet you in the arrivals hall before transferring you to the volunteer house. Please ensure that your flights are booked during the times stated, as there is a ‘welcome dinner’ in the evening which you do not want to miss! The easiest way to get to Ketapang is travelling via Jakarta (with a change over in Pontianak). In order to join this project, you will need a tourist visa. You will be able to get one of these on arrival into the country of Indonesia, but please note that you may have to pay for this on arrival at Ketapang Airport. Visas are of the volunteer's own responsibility. If you plan to stay longer than 30 days in Indonesia, you will need to arrange a 60-day tourist visa in advance. The cost for the 60-day visa can vary depending on which Indonesian embassy you are applying through. The currency in Indonesia is the Indonesian Rupiah. 1 IDR is approximately 0.00006 GBP, 0.00009 USD and 0.00007 EUR. Please check www.xe.com for live exchange rates. Would like to make a special mention for the volunteer facilitator Meggie who was fantastic. Made sure we had everything, really good fun and dedicated to her work. Favourite Moment: Seeing the baby orang-utans in the jungle. We were lucky to see how the baby orang-utans use the enrichment packages that we made. We had a very well rounded trip. We got to do a range of different activities. We felt that we had helped the project with our work. The facilitator Meggie was fantastic. She was enthusiastic, a great motivator, terrific singer and all round wonderful person. Second only to the orang-utans, she would be my favourite memory. Every Single Moment Was Just So Amazing! I'll never forget visiting the baby school on our last day and watching the little ones cover themselves in sawdust and enjoy the enrichment we had made them. The Project Coordinators Went Out Of Their Way To Look After Us! It was amazing meeting the entire team and working alongside such dedicated people, whilst having the orangutans watching us whilst we worked! The Project Was Amazing As Expected! Interacting with the Orangutans while repairing the boardwalk or in Kindergarten and baby school doing enrichment activities was incredible, but what made the whole experience was seeing a small part of the real Indonesia - there were always smiling faces waving at us! It is impossible to single out only one memorable moment. The entire experience will definitely stay with me forever. I really hope to return someday! I loved seeing the baby orangutans in school and in the kindergarten! I would really like to thank my facilitators. Hery and Matt are the best team! I would not hesitate to come back! Seeing the babies in baby school and kindergarten was incredible. Matt and Heri are the best facilitators! Everyone that I met during my stay was incredible. My Heart Would Sing With Emotion! At 3pm every day the babies would trundle past in their wheelbarrows. The curiosity, togetherness and all round sweetness was an absolute joy to behold. My heart would sing with emotion. International Animal Rescue is an animal welfare non-profit organization based in the United Kingdom that comes to the aid of wild and domestic animals with hands-on rescue, rehabilitation and release. The Indonesian portion of Borneo, or Kalimantan, is the jungle-filled, exotic heart of the island itself. Populated with indigenous tribes and comprised mainly of ancient forests, this area of Borneo exudes mysticism and magic. Kalimantan is one of Indonesia's least visited regions, which makes it an incredible destination to explore for the adventurous traveller wishing to trek through verdant rainforests, against a backdrop of rolling vistas, powerful rivers and majestic mountainscapes. The city of Ketapang in West Kalimantan is the setting for this particular project. A small, but lively city, it is located in the stunningly picturesque delta of the Pawan River. Ketapang is surprisingly diverse given its remote location, and is populated by many minorities that infuse its culture with varied and fascinating influences. Also on the doorstep of Ketapang is the incredible Gunung Palung National Park, which is home to an unbelievably diverse range of species, flora and fauna. This city truly provides the best of both worlds, what with a vibrant, cultural heritage and some of the island's most stunning, natural phenomena just outside its limits.